Grant McCann says he and his Doncaster Rovers players are determined to prove their doubters wrong. Very few people tipped Rovers to be among the League One frontrunners this season. And pundits on the Not The Top 20 Pod - which was aired by Sky Sports - have predicted that Doncaster will be relegated. But McCann, whose side lost for the first time this season at Burton Albion on Saturday, is insistent that Rovers can silence the people that have written them off. “Before I came in everyone had us to be just above the relegation zone,” said McCann. “That’s what is driving me and the players every single day of the week. “We’ll be in and around it, there’s no two ways about that. McCann was disappointed with certain aspects of his side’s performance in their 1-0 defeat at the Pirelli Stadium, notably their start to the game and ‘slow’ build-up play. 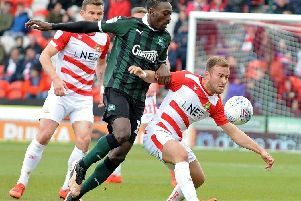 “We know we can’t start games like that, we know we can’t be sloppy and we can’t expect to kick straight balls into centre halves and expect John Marquis to flick things on against 6’2” or 6’3” centre halves,” he said. “He can win his fair share of battles but it’s not the way I want to play. I’d rather us take risks. “And if we lose the ball, react. We didn’t do that. The reaction and transitions we play we’re just off.